I love fancy dress. Oh yes. Any excuse to get dressed up and I am a happy bunny. I've pulled off some crackers in my time..... Beetlejuice, Amy Winehouse, an American Trucker, a chav. I love making a real effort and have never dressed up as the same thing twice. The best bit is that my love of fancy dress has most definitely rubbed off on my mini-me. At two and a half years old, she has the most fantastic dressing-up box; one I wish I'd had when I was little. 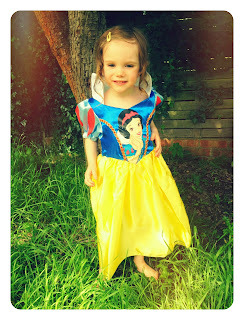 I adore the fact she is really getting into imaginative play and loves dressing up and pretending to be a character. It's something I am more than happy to encourage. Daisy is completely and utterly Disney Princess obsessed at the moment, so when Jokers' Masquerade offered her a Disney Princess costume of her choice, she was very, very excited. Jokers' Masquerade are a long established online company that specialise in both adult and children's fancy dress. Their website is packed full of ideas and inspiration for costumes and is really easy to navigate around when you know what you're looking for! 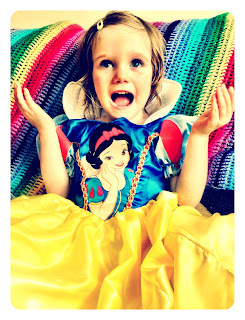 After much deliberation (this is not an exaggeration; she genuinely did spend about an hour pouring over the website, deciding which costume was her favourite) Daisy opted for a Snow White costume and we were very impressed when it arrived only two days later. We ordered the costume in a size small, which the website claims is for 3-4 year olds but fit Daisy just fine (she is a tall and skinny two year old). There is plenty of room for her to grow (I don't doubt it will last her until she is four) - and growing room is an important factor to me when buying things that I want to last. At the same it doesn't hang off her, so she can wear it straight away. The material isn't luxurious (it's 100% polyester) but it is hard wearing and, as we found out after an incident with a raspberry ice pole, it is wipe clean too - and on top of that the costume is very well made, which you would of course expect from Disney. All of these are definitely selling points for me. I think she looks absolutely gorgeous in it, and she loves it too. It's a fantastic addition to her dressing up box - some more Disney Princess costumes will definitely be joining this one - and I will definitely be using Jokers' Masquerade again. If you're a fan of fancy dress like us then definitely pop over to their website here. They are also on Facebook (here) and Twitter (here). If you're not so keen (boooooo!) then dressing up costumes also make great gifts for children so why not consider buying one as a birthday or Christmas present? Jokers' Masquerade's prices really are so reasonable (trust me, I'm a fancy dress shop pro!) and they have lots of delivery options, including next day and Saturday slots if you're having a last minute panic. I need a party to go to now, so that I can dress up as this! I love it!